Our winter magazine features stories about how treaty tribes are using innovative hatchery techniques to save salmon and resident orcas. You can download a free copy of the magazine here. The Nisqually Tribe is changing how it spawns hatchery chinook in an effort to give orcas a bigger meal. 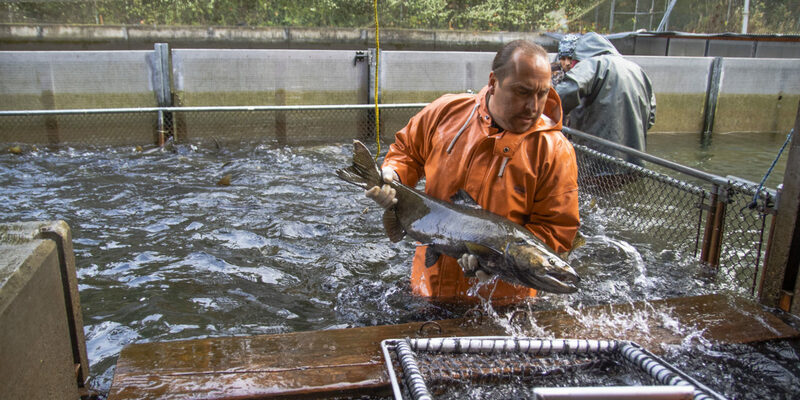 A South Fork Nooksack River hatchery program that took juvenile chinook salmon into “protective custody” no longer has to collect broodstock as fry to raise in captivity before spawning them. Not only are the adult offspring of the captive broodstock returning to Lummi Nation’s Skookum Creek Hatchery each fall, but so are some of the offspring of their offspring – second generation adults. Plus, there is genetic evidence that some of the hatchery-origin chinook have successfully spawned in the river and produced natural-origin offspring. “The South Fork Nooksack watershed had the largest natural escapement in recent history,” said Tom Chance, Lummi salmon enhancement program manager. This edition also includes stories about successful shellfish management, wildlife reintroductions to the North Cascades and salmon habitat restoration efforts. Emiliano Perez, field crew supervisor for Nisqually, collects large returning adult chinook salmon to spawn with others similar in size. E. O’Connell.